It's been a very productive and restful Spring Break for me so far. We've had a mix of nice and rainy days but the weather has definitely warmed up for spring. All the magnolia and cherry blossom trees are in bloom and I have even spied the tulips starting to pop up! Amazing how early our spring has come this year. My sewing machine has been busy too. I managed to finish a rag quilt in 3 days. It took a lot of work though and it isn't perfect by any means, but it is done other than the tedious snipping I have to do and the last throw in the wash and dryer. Baby Bean will love it and that's the most important thing right?! I've also been researching cloth diapers and what baby needs, which we are sorely lacking but I think we will be okay. Bean doesn't need much in the first few months other than me! Bean has been jumping, jiggling and kicking around in me and sometimes, gives me discomfort with sharp jabs to the bottom of me. OUCH! I can hardly wait to meet our little one! Plus I want to "sleep" without acid coming up my esophagus every night. I say "sleep" with quotations because I know I won't get a lot the first little while. But that's okay since we will have a sweet little one to love. As for stitching, I've put in a lot of love into JCS and have been doing eyelets and backstitching. I've yet to find a spring design to stitch with all my other crafting going on but that's okay. There's still time left! The Nashville releases have been tempting but with the Canadian dollar so low and the postage rates so high, I've passed up buying anything. Although I did purchase a linen grab bag and chart from the Scarlett Letter and was shocked at how much I had to pay for the two things. That's the last of stash buying for a LONG time! You came here for some eye candy so here it is! The little ceramic button is made by my friend, Niki Holmes, quite a talented pottery artist. The yarn is actually very white but I think the hue of the IG mode made it look pink. Here's some adorable cotton fabric hubby wanted for another baby blanket. Funny thing is he said he was going to make it and now, he's asking me to do it! Love bees and this blanket will be simple yet sweet. JCS has some lovely little eyelets and backstitching peppered throughout the design. I'm nearly done with the backstitching and then I can move onto more cross stitching. I may start Adam and Eve next. I adore that little hear in the corner. So pretty!! Now the blooms of Spring. 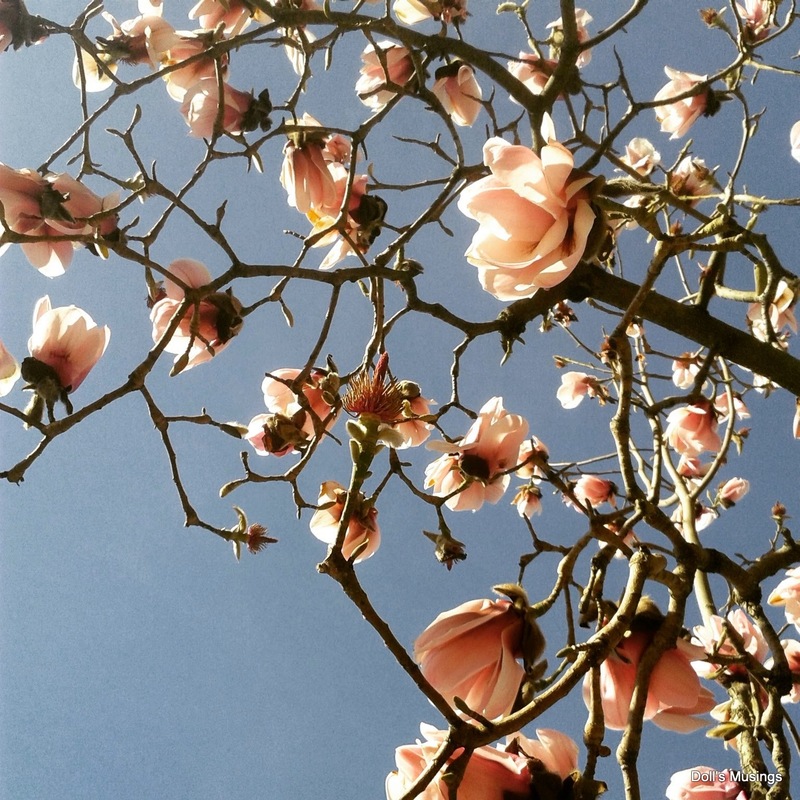 I've been in awe of all the magnolia trees that have been opening their luscious blooms for us. They come in so many different varieties it's amazing! These last fushica blooms are stunning to see. What a vibrant colour! Couldn't leave without a photo of some cherry blossoms. I have so many more flower photos but I'll save them for my next post! Hugs to you all and thanks for visiting!! Lovely quilting and stitching. The bootie is so cute! Sound like Bean is full of energy! Sorry you are having indigestion and sleep trouble. Guess it goes with Motherhood. I never had kids so no advice from me. Postage rates have really gone crazy! And the service has become more spotty too. Not so great for our stitching community, but a lot if stash built up is quite a help! pretty quilt. Love the fabrics. Flowers are in bloom where you are. The magnolias are amazing, I love when they appear over here - most likely another six weeks or so before we'll get close to that happening. You've been very busy with your crafting, all such lovely things too. It's getting closer! Have you researched slings and wraps? They are a great way of keeping bean close but still having your hands free. JCS is coming on really well and the bootee is just so tiny and cute! Such beautiful blooms!!! I really love that bee fabric! Oh my goodness! That bootie is precious. What a great rag quilt Anne. Could you elevate the head of the bed just a bit? I love your rag quilt and that gorgeous bootee! You're so clever. I'm sure you will get many many gifts when Bean arrives and as you say, they need very little in the beginning. The quilt is beautiful and Little Bean will snuggle nicely with it. So is your plan to use cloth diapers? What a darling little quilt! Little Bean sounds like an energetic fellow! Beautiful quilt and stitching Anne. I love the pictures of all of the blooms. I know you are excited for Little Bean to make his/her debut! Enjoy those last months of pregnancy -- things will change very quickly. lol! The cloth diapers can be a pain but they are a good way to go. We used these wool diaper holders -- I can't remember what they were called, and this was 20 plus years ago too. They probably have better things on the market now. Love the rag quilt, and the fabric, and the little bootie. Have loved seeing all the magnolia pics and cherry blossoms too. I can't wait for our magnolia to bloom! 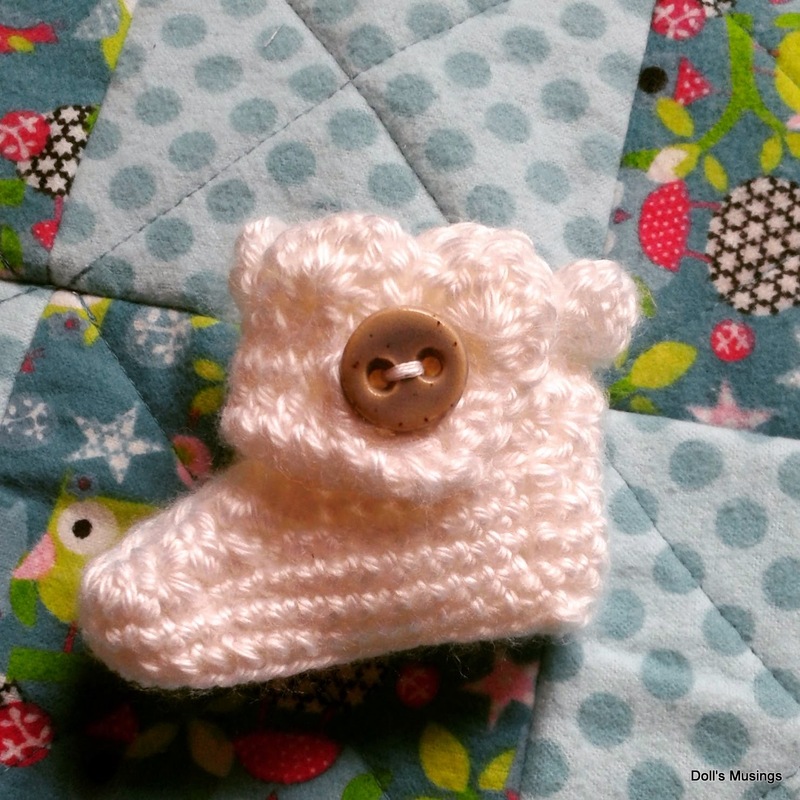 A wonderful blanket you have made, its adorable as is the little tiny bootee. Very sunshiney skies you captured in your flowers pics. My first thought was "what's a rag quilt?" I'd never heard of it before. It looks very nice though and not made of rags like I'd expected - lol. You've been busy, little mama! It's that nesting thing happening and it's all good! 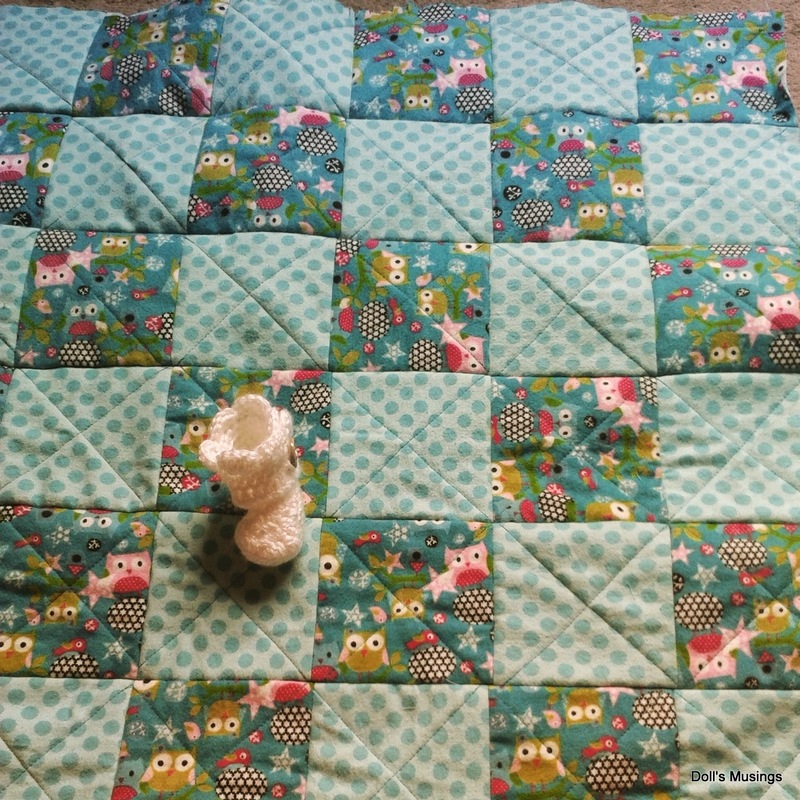 Your baby quilt and bootie is so sweet ! I hope you will continue to do well with all the kicking and moving going on. Baby Bean is ready to see the world ! Glad you are making such awesome progress on JCS - it's a beauty. Your large smpler looks really pretty and you have already achieved a good proggreswih it-well done 1 Those flowering trees are just geaorgeous -I have never seen magnolias in bloom for aplletrees to be in bloom we have to wait for late May...Greetings from Finland ! *squeeeee* It's a little bitty booty! So cute!! Love that quilt and booty! What gorgeous flowers, just love them! Such a lovely quilt! The bootee is so sweet too. 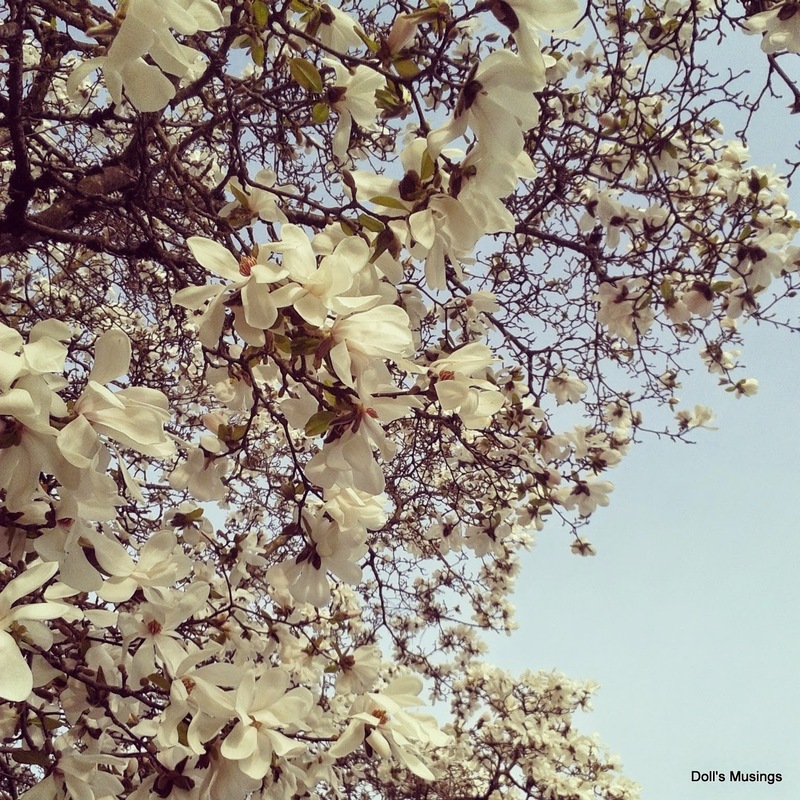 Lovely pictures of the magnolias in bloom, they are only starting to bud here. Look after yourself, soon that little Bean will be in your arms! I'm so glad you had a good break and the spring weather is coming at a perfect time for the arrival of your little one. We are a long way from cherry blossoms or anything blooming so I love seeing your photos, Anne. Sorry about the digestion problems, I didn't encounter those when I was pregnant, but I seem to have them now and then now that I'm older--not fun!! Such a cute little bootie! And the quilt is going to be perfect for Baby Bean's arrival. Considering all the demands on your time, your stitching is coming along nicely! Big Hugs! So nice to hear that you were making the best of your school holidays. Oh what a lovely quilt you made for your little Bean. 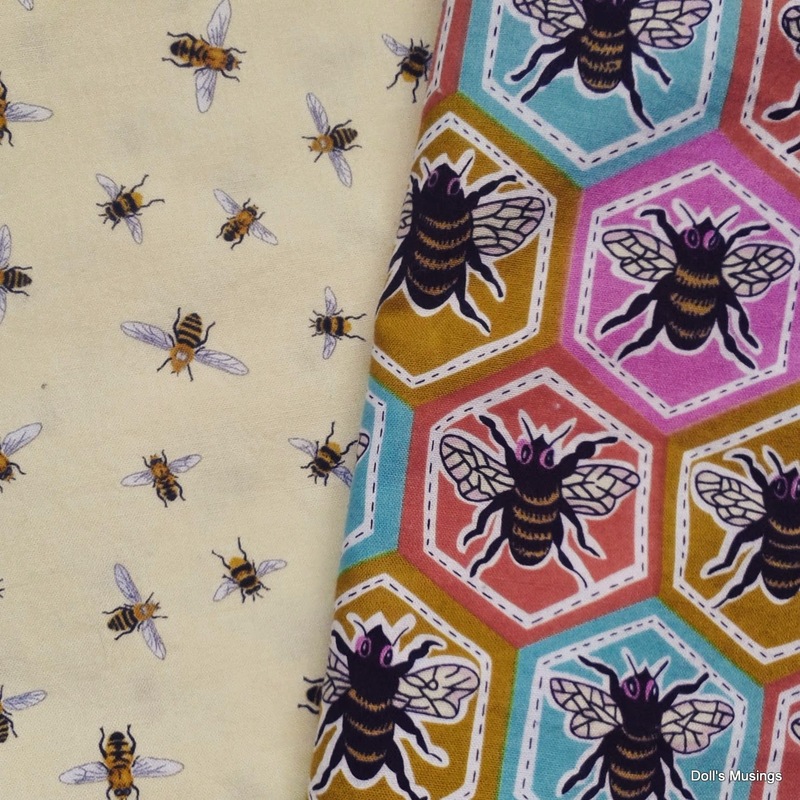 I love the sweet owl fabric - and also the new quilt with the bees will be beautiful. Nice progress on your sampler. 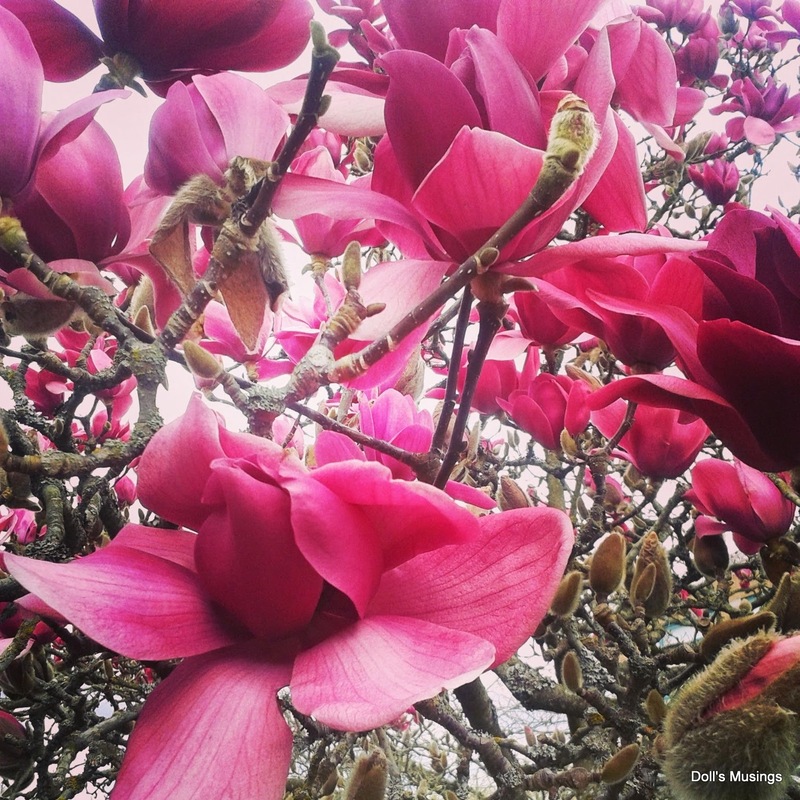 Magnolia trees are my favourite trees because their blooms show that spring has arrived. Unfortunately they are very rare up here in the mountains, it's just not the right climate for them up here. How fun to have read that you also made a rag quilt. I have to get busy with one for my grand niece. She is graduating collage. Yours is adorable and has cuddle factor for your upcoming bundle! Your spring weather is farther then ours. We had no winter this year so are anxious to get into spring and seeing our garden come to life. We are sick of cold winds and rain. What is the designer of your last stitch...bitter flower? I love it and you did a beautiful job. I am collecting bee charts to make for my kitchen and want to look for this one. Oh gosh, Anne, I remember those horrible heart burn nights! Lovely stitching and knitting and thank you for the blossom pictures. We got snow again yesterday! So a very late comment from me, but still with love.!! I love love love the Magnolia flower! I put a plant of it in my garden last year, really hope it will give me flowers!! here it's still to cold, I haven't seen blossom flowers yet.. BUt the green is getting there!! 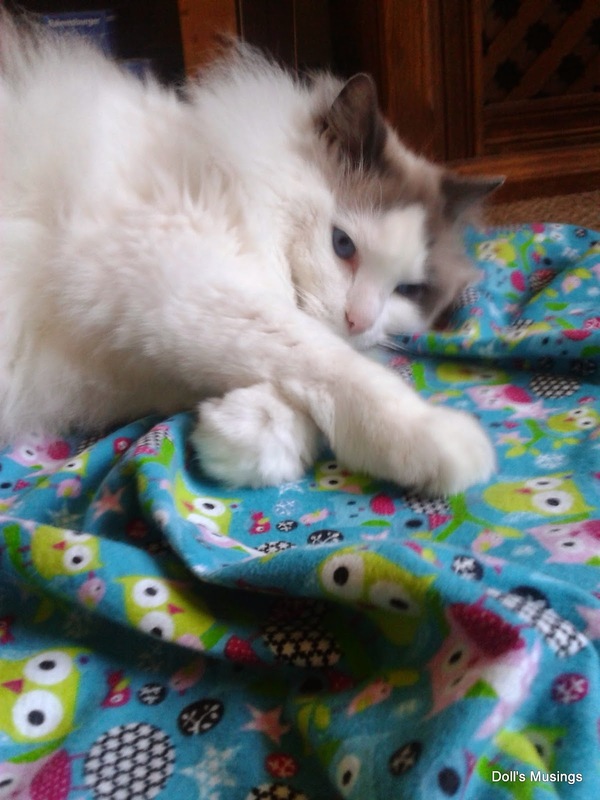 Ow My your quilt is so darn cute!! Baby bean will love love it!!! The show is so darn cute too.. Your on a roll sweteie.. great job on teh stitching too. Eee, baby stuff is just so cute! We aren't planning on having kids (yet?) but all the little baby items make me squeak in delight. Your little bootie is just adorable and so is that cute owl fabric! Beautiful flowers, too! We have yet to see much in the way of blooms down here which may be a good thing as it's supposed to dip below freezing again this weekend. I'm so ready for spring! Diaper cloths (lots! ), baby clothes (they also change a lot), some warm blankets and a good bag to put everything you need when you go out... I think those are the essentials!